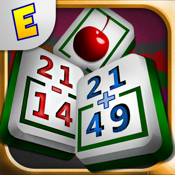 Mahjong Math Free is a super challenging math puzzle game that will leave your heart racing and your head pounding! Simple two digit addition and subtraction problems are on the tiles. These are the types of math problems that anybody should be able to do or learn to do quickly in their head. You just calculate the result and find a tile that has the same result. BEWARE: This is mahjong like you have never played it before. Solving a single puzzle can take anywhere from 30 minutes to 3 hours. The more you play the quicker you get! With 56 puzzle layouts you will be a math whiz before you know it. Each puzzle has random tile orders so you can play again and again with it never being the same. Mahjong Math Free has a unique scoring system that rewards you for speed of individual matches and a star based system with more stars for more points. This is a great game for children or adults who want to challenge their mind and keep their math skills sharp. Because of the difficulty of this game, this is the one EnsenaSoft game where we recommend you try the Free version before you buy to make sure it is something you truly enjoy and are able to do. If you enjoy it then you can buy the full version for 112 additional puzzle layouts, no ads and Game Center integration.